Sub-Division 3 was previously a unit under the hierarchy the “Registration Division”, situated at Phahoyothin Road, Chomphon Sub-district, Chatuchak District, Bangkok Metropolis which used to be responsible for works according to the Cars Acts, B.E. 2522 (1979), Land Traffic Act, B.E. 2522 (1979). Later in 1987, there was a mission transference of Cars Acts’ all missions to the Department of Land Transport, Ministry of Transport which had been given the mission about the Television and Radio Tapes and Material Act. Later in 2004, there was the Cabinet’s resolution to transfer the mission in the responsibility about the Television and Radio Tapes and Material Act to the Ministry of Culture. Later in 2009, there was the Royal Thai Police’s Hierarchical Arrangement Decree B.E. 2552 (2009) and Ministerial Rule on Royal Thai Police’s Divisions and Other Units B.E. 2552 (2009) to change the name of the “Registration Division” into the Consumer Protection Police Division (CPPD) on 7 September 2009 to be the Sub-Division 3 and determination its structure to have authority in the investigation, inquiry, suppression and arrest the offenders all over the Kingdom of Thailand according to the job description about the Thai Industrial Standards Institute (TISI). Criminal Procedure Code of Thailand, to operate jointly with or support the other organizations’ related operations or assigned jobs, to make campaign on the prevention and suppression of the offenders who perform, assemble, produce, import or distribute standardless goods which may cause danger to the consumers’ bodies and lives, especially the general children and youths. Such goods or products, for example, are electric appliances, mobile phone batteries, toys or children utensils, robots, radio-controlled miniature vehicles whereas such things are governed by some related laws such as Industrial Product Standards Act. General Staff Affair engages in the duties and responsibilities of administration work consisting of administration , documentation and records, personnel administration , legal affairs, legal case proceeding or litigation and disciplinary code, policy and planning affairs, strategic operation, financial and accounting affairs, budgeting affair, logistics, welfares provision, staff assisting and clerical or secretarial affairs, information technological and communications affairs, public relations and information disseminations affairs, educational and training affairs and intelligence affair. Operation Team 1 is responsible for area of Bangkok Metropolis, Metropolitan Police Division 1 and 2, Provincial Police Region 2 and 5. Operation Team 2 is responsible for area of Bangkok Metropolitan Police Division 3 and 4, Provincial Police Region 3 and 4. Operation Team 3 is responsible for area of Bangkok Metropolitan Police Division 7, 8 and 9, Provincial Police Region 1 and 6. 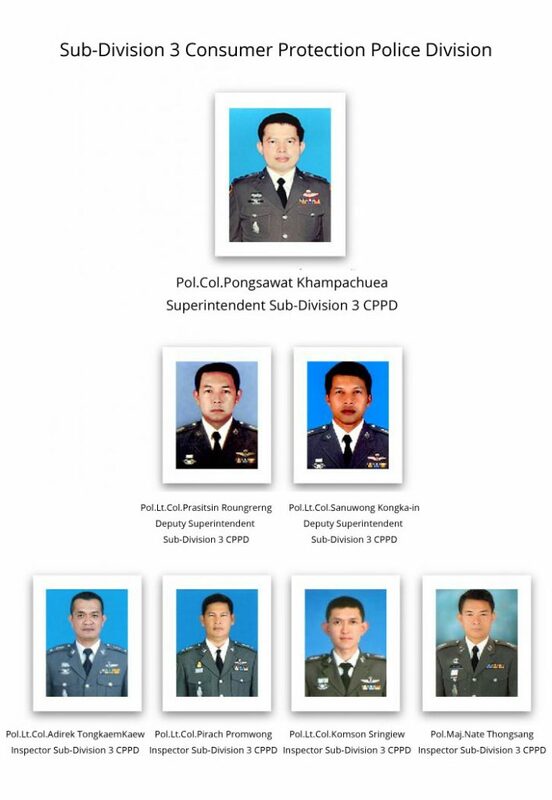 Operation Team 4 is responsible for area of Bangkok Metropolitan Police Division 5 and 6, Provincial Police Region 7, 8, 9 and the Southern Border Provinces Police Operation Center (SBPPPC or Sor Chor Tor). Inquiry Affair The organization has authorities, duties and responsibilities about how to comply with the Criminal Procedure Code of Thailand, to investigate, inquire on offenses punishable criminally according to the Industrial Product Standards Act, B.E. 2511 (1968) and its amendments or criminal offenses according to other related all offenses over the Kingdom of Thailand, including the joint operations with or support the other units which are related to or assigned.